John A. "Junga" Borges, Jr. Celebrating the life of John A. "Junga" Borges, Jr.
Obituary for John A. "Junga" Borges, Jr.
NEW BEDFORD-John A. 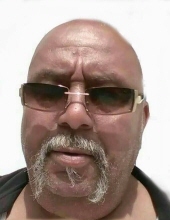 “Junga” Borges, Jr., 58, of New Bedford died unexpectedly Monday, February 4, 2019 at St. Luke's Hospital. He was the son of the late Mary E. "Betty" (Lopes) Borges who passed on February 25, 2019 and John A. Borges, Sr.
Born in New Bedford, he was a lifelong resident and was a communicant of Our Lady Of The Assumption Church. John was a U.S. Army veteran attaining the rank of Private, First Class and served in Germany. He was the recipient of the Army Service Ribbon, Overseas Service Ribbon and Expert M-16 Rifle and Hand Grenade Badges. He was formerly employed as a cook at the Wamsutta Club in New Bedford as well as several other establishments on Cape Cod. Affectionately known as the sheriff of his neighborhood, he spent many hours on his front porch watching over his neighbors. “Junga” enjoyed listening to oldies but goodies, spending time with his family and socializing with friends. His family includes his son, Tyson Borges of Wareham; his brother, Andino “Dino” Borges of New Bedford; his two sisters, Darla J. Graves of Fitchburg and Debra L. “Debbie” Borges of Reading, Pennsylvania; his Godson, Geophrey Graves and several nieces and nephews. Visitation for "Junga" and his mother, Mary E. "Betty" Borges will be Thursday, March 7, 2019 at 9:30 A.M. followed by a service to be conducted in the funeral home at 11:00 A.M. Interment with military honors in Massachusetts National Cemetery, Bourne. In lieu of flowers, donations may be made to Aubertine-Lopes Funeral Home to assist with funeral expenses. Funeral arrangements entrusted to AUBERTINE-LOPES FUNERAL HOME, 129 Allen St., New Bedford. To send flowers or a remembrance gift to the family of John A. "Junga" Borges, Jr., please visit our Tribute Store. "Email Address" would like to share the life celebration of John A. "Junga" Borges, Jr.. Click on the "link" to go to share a favorite memory or leave a condolence message for the family.